The Hill of Tara (Irish Teamhair na R�, "Hill of the Kings"), located near the River Boyne, is an archaeological complex that runs between Navan and Dunshaughlin in County Meath, Leinster, Ireland. It contains a number of ancient monuments, and, according to tradition, was the seat of �rd R� na h�ireann, or the High King of Ireland. Recent scholarship claims that despite the rich narratives derived from mythologies, Tara was not so much a true seat of kingship, but a sacral site associated with kingship rituals. Very atmospheric shot! I like the light and the composition... It is difficult getting a good tone when there are very bright areas and darker ones too. Good job. 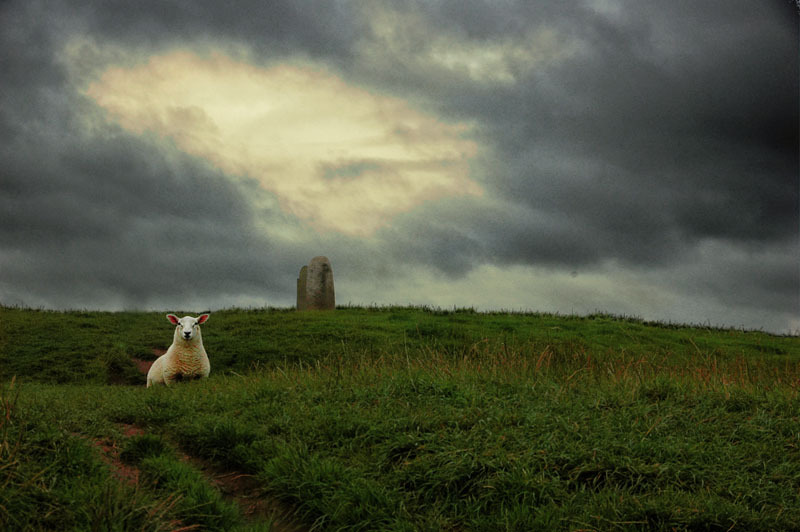 The dramatic sky and the funny pose of the sheep creates a fine image. Excellnt contrast and the low light is superb. Une image instantan�e qui montre une sc�ne insolite avec ce mouton dans cette m�t�o incertaine. Une belle atmosph�re obtenue grave a une bonne exposition. The drama of this shot can be felt even on the thumbnail! The light is mysterious and wholly appropriate. The curious, focal sheep is perfectly placed in the frame, whilst the second focal, stone posts continue the theme of mystery. Great landscape whit this lovely ship! Super lighr and fantastisc sky. Nice dramatic sky and the stone monument at the crest of the hill adds drama. The cheeky sheep adds to the overall composition. merveilleus image, ce mouton dans ce pr� vert, avec le ciel et la tour�e, une merveille, le dolmen, superbe compo. Hello James! Amazing lonely lamb, wonderful landscape, excellent dangerous sky, good colours, perfect saturation, very good sharp. Well done! Once again great shot in a photographic country.Simplicity at its best, well done. what a funny shot. The white sheep is a beautiful contrast in the green environment. Beautiful dark sky and colours. The sharpness on the sheep is perfect! Good composition and POV. Well done!